The problem is, I can’t find this plugin on wordpress.org or anywhere else. What’s worse, your comment indicated that the custom roles plugin is covered in detail in your instructions for Wholesale Pricing but those “instructions” are nowhere to be found on your site or within the plugin zip file. Please provide the instruction or detail so that I can get the plugin. 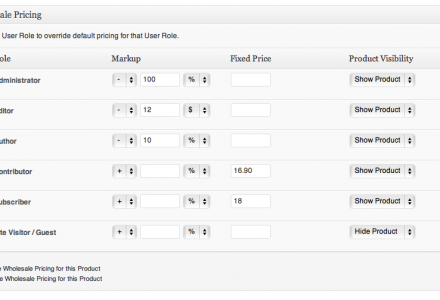 I’ve already purchased your Wholesale Pricing plugin and want to use it in tandem with the Custom User Roles plugin. Thanks. Thanks Michael. I found some instruction pages from wordpress.org on how to create unique roles. 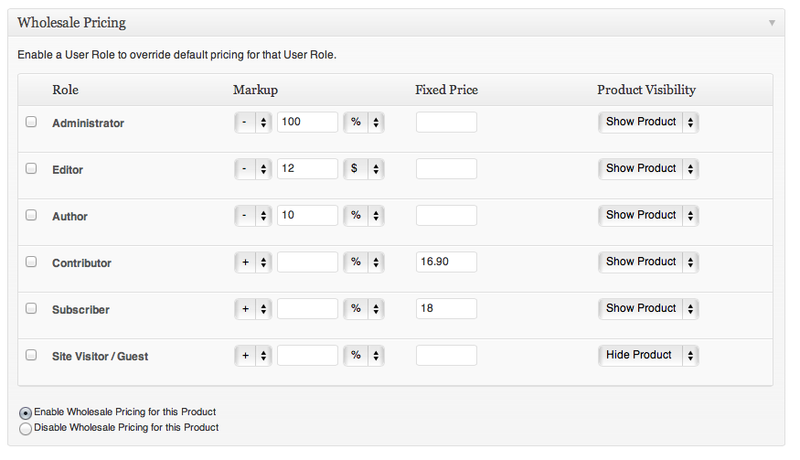 I just hope your wholesale plugin plays nice with my hacks if the Custom User Roles plugin can’t be found. Hi Michael, I am very interested in this plugin, however my client is using wp-ecommerce with the Tikipress plugin and wishes to offer a wholesale price for members, but for tickets only. Is it possible to configure the wholesale price to be applied to only certain products or a product category? Hi Carlos, my Wholesale Pricing currently supports per-User Role pricing levels, in the next Plugin update I’m pushing for per-Product pricing support across User Levels which will enable your client to do just that. Getting it all to play nice with 3.7 as well as 3.8 is the mission as I’d prefer to support both than force 3.8 support. Any ideas on when the updates for “per-Product pricing support across User Levels” might be ready? Right now it seems that you can only add $ or a % to the all products not to individual products. Is that correct? Good option if you want to give say all staff 25% off all products but not great if you want to mark down certain items and not others, or mark some item down at different prices/percentages than others. Hi Cathy, you’re right, aiming for release next week! 😀 Fingers crossed might see WP e-Commerce 3.8 go RC then too. Wow awesome! Perfect timing on both! 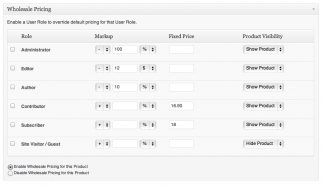 Can the Wholesale Plugin display different product sets based on user role? For example, I’d like to allow guest (retail) customers to view and order single items but wholesale customers should to view and order items only by the case. I think this would allow easy shipping calculations as well. This is exactly the solution I need as well. Just showing some support. Thank you for the reply. My customer is an online retail store that sells boxes of dog and cat treats. In addition to retail customer sales they would like to allow the boutiques that (re-sell) their products to be able to refill their orders as well. In an ideal situation retail customers would only see single items for sale and wholesalers would only see cases of the same. The only problem is we’re currently only using flat-rate shipping since the USPS shipping module can’t return a proper shipping rate. That means I’d have to rework my shipping module for wholesale pricing and shipping of cases as well. If I can’t use the wholesale plugin I guess I’m looking at two implementations of WP and WP E-Commerce, right? Thanks for the reply, but I don’t fully understand your response. Do I also have to install a roles plugin? and your plugin? I’m trying to find out, how I can create a different role for customer vs member? Does your plugin handle this function. I can have separate links for customer and visitors, since the pricing will be the same. But I’m still confused on pricing for Members, which will be wholesale. Will I create two separate product pages? I’m not understanding the logistics with wp ecommerce plugin? Thanks again for any help and when do you anticipate the updated 3.8 beta to be ready? I’ve been trying to find out about an option that i need. I noticed a previous response was that a guest could see regular pricing and members will see wholesale or discounted pricing? Can this be setup for Customer price(retail price), which is also guest price and Member Price(wholesale price)? Can both login? This looks like it will meet my needs, I currently have a retail site, but I want to make it a wholesale only site. Can I hide all prices from guests? So that there is no retail price, only one wholesale price. I would just make the whole site password protected, but, I still want guests to be able to browse inventory. Will your add-on work for this application? I am interested to know when this will be made into a plugin rather than an addon. It’s been a couple of months since your last estimated completion date and I haven’t heard from you. Hi Jas, what you’re after is something that Wholesale Pricing does not cater for, you could hide the store behind a members login system and use the Manual Payment payment option for ‘pay on account’. Hi, plugin looks good – can logged in users have a ‘pay on account’ payment option. so instead of having to use paypal or some other credit card option they can choose to put it on their tab or account? Your Readme.txt mentions nothing of this, and only provides one wholesale user pricing level. I need this to work as you have described but currently there seems to be no way of doing this? Hi marie, you’ll need to add a condition that checks if the user is logged in – is_user_logged_in() – to hide prices from guests. This way you can setup different pricing levels for different users who will be the only ones to see the Product price. is it possible to have no prices on the public website, and several (20) levels of pricing by using this addon, each linked to a custom user role? This plugin sounds awesome! Can I ask if this will allow me to hide my wholesale products from being shown on the site to the general public? The reason is that I have two different product ranges(wholesale and retail) not one product range with two pricing structures. So I would like to have a Wholesale page (requiring a login) that displays the ‘wholesale’ product category. I though I could do this with a standard ‘member access’ plugin but unfortunately this idea is no good as unlogged in guests can still directly access individual wholesale product pages via a google search (rather than through password page). So… is there the ability to ‘restrict access’ to certain product categories to guests on the site who are not logged in? I’m very interested in this feature as well. Could we get answer, michael? I’m thinking of using this wholesale pricing plugin. I’m building a membership site. I want different levels of subscribers to get bigger discounts on products in WP E-Commerce. I have the WPMUDEV.Org Membership Plugin. But it doesn’t use roles. Above you mentioned “Custom Role Plugin” but I’m not sure which one you mean. I need to figure out a way to integrate the two things together.